Our family house is not exactly dated, but it was most likely built in the 1720’s. Its present appearance dates back to the year 1831, when it was last enlarged and the homestead reorganised, but the main premises remained, all done in the traditional Karst style. In 2014, we finished a decade-long complete renovation, at all times showing great respect to the rustic layout, to cultural traditions, as well as to the family’s heritage. With something over 100 house numbers in the village and a not more than 220 inhabitants, this is truly where the heart of Karst is. Nestled between the vineyards and sunny hills, Pliskovica is one of the villages that produce the famous Teran, which originates from the region. The colourful meadows, hard reddish soil and peaceful landscape are bound to take your breath away. To see in the village: baroque St. Thomas’s Church, a 400-year old linden tree, a well from 1892 and a special vine lath – the supporter of European friendship. Pliskovica resonates a bit peculiar when spoken in Slovene. 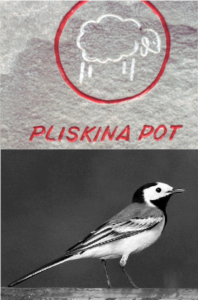 Pliska is essentially a tiny and lively bird, the white wagtail, present in the region for centuries. But the first settlers of the Karst, who were mostly shepherds, supposedly named their sheep and goats, also very lively, ‘pliska’, so it is easier to believe that the village got its name after this tradition. You will also find the so-called Pliska’s trail near the village, a learning path, marked with a white sheep carvings in the stone. In any case, Pliskovica is one of the largest villages in the middle of the Karst Plateau, only 10 km away from the Adriatic Sea. Hiking or biking here is just fabulous! Go to Veliki dol, Tubljen, Kregolišče or Kosovelje or Dutovlje and find great hospitality, rustic wineries and lots of other little treasures. Vacation Home Rozina is a well-preserved example of a typical Karst folk architecture located just in the outer, western side of the village. One of the characteristics of Karst homesteads surrounded by vast vineyards is the great functionality of the various spaces, both economic and residential. If a family was wealthy enough and its property large enough, they would even build a wall around the homestead, which sheltered the household from the sometimes unpleasant Bora wind and provided additional calmness and peace to everyone within. Today’s owners Branko and Andra, who is Rozina’s nephew, put a great deal of care in the last 15 years to completely renovate the vacation home. Before the First World War, the house burnt down and they had to re-build up this part: this is today’s dining room and above it, the living room. Viktor, Rozina’s brother (Andra’s father), left the homestead when he was no more than thirteen, but his dear sister stayed. 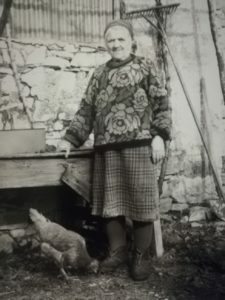 Rozina’s and Viktor’s father died young, while serving in the Great War, and their mother struggled hard to make ends meet; she baked pastries and sweets in order to sell them in the village or in Trieste. Rozina made her own, fantastic Teran which she sold in larger quantities to a merchant from Bled. He came back for more each and every year. The reason why is no secret – it was her love that made it so special, as every grape for her wine was harvested by her own hand. Our dear Rozina was a lucid, hard-working but a very happy person, always in a good mood and with lots of positive energy, which permeated the entire residence. Neighbours adored her and described her as a vivid individual, who liked to dance and cheered when the occasion was right – or even just like that. She just liked to look at the life a bit foolishly. Well, what else a man could do, but to embrace our existence and enjoy living as it is.